I finally got in for my long-overdue yearly physical. I was absolutely dreading my physical. I know I’ve gained weight the past couple of years. And I absolutely feel like crud these days. So when the following questions were asked of me, you can just imagine what happened next. Most of the time I’m on autopilot and I’m not emotional about any of what I am dealing with. It’s not until someone point blank asks me how I’m doing that the emotion comes to the surface. 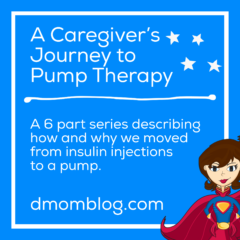 I remember the first appointment after Q’s diagnosis. 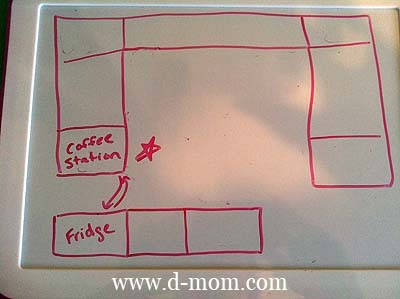 I had been in “mom mode” getting done what needed to get done and supporting her. But when the social worker came in and asked how I was doing, well, it’s difficult not to shed a few tears. As if I needed her to tell me that. 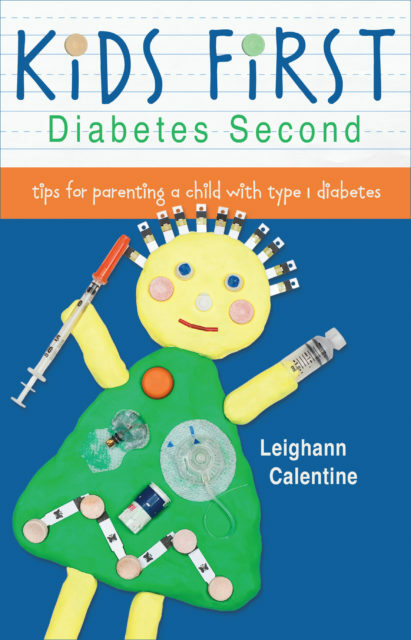 Have you found a way to strike a balance between taking care of your children (all of your children, not just the ones with diabetes) and taking care of yourself? My good friend George, AKA Ninjabetic, has once again prompted us to write about anything but (that medical condition which shall not be named) today. So today I’m talking about morning coffee. In the morning I really like having a cup of decaf. Newman’s Own Organic decaf, to be exact, with a little Sugar in the Raw and cream. 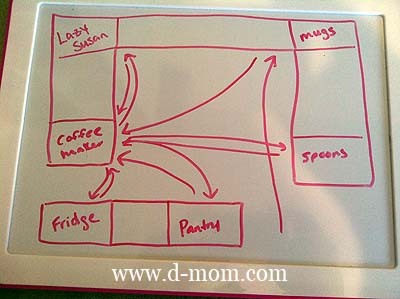 Although we have a work triangle in the kitchen, it took several extra steps to get everything I needed to make my morning joe. Coffee was in the pantry. 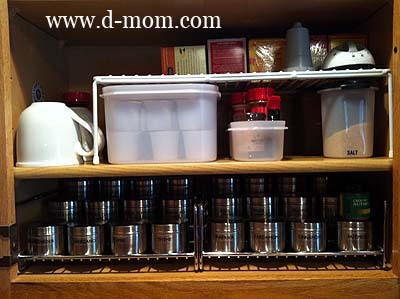 Sugar in the lazy susan. Spoon in the silverware drawer. Mug in the cabinet with cups. Half and half in the refrigerator. And the coffee maker next to the stove. I could do much better than this! 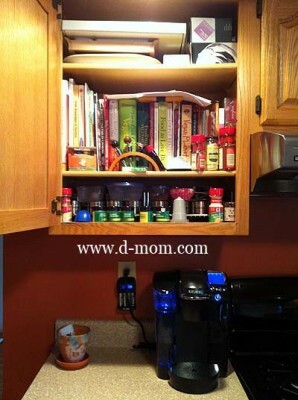 I have a cabinet that contains my cookbooks and spices. 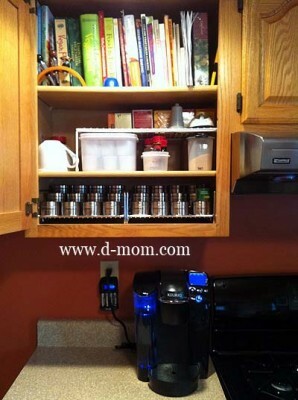 I don’t use my cookbooks everyday so I changed the spacing of the shelves to put the cookbooks higher, kept the spices on the bottom shelf, and created a coffee and tea shelf in the middle. Now everything is right within my reach, including filling the carafe with filtered water from the fridge and grabbing my half and half. 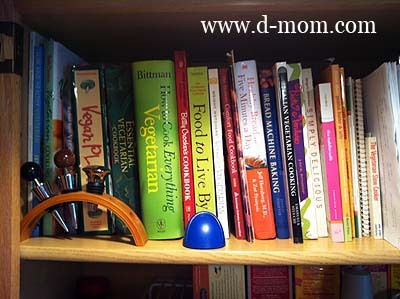 You’ll notice almost all of my cookbooks are vegetarian. The one I’ve been using the most lately is How to Cook Everything Vegetarian: Simple Meatless Recipes for Great Food by Mark Bittman. I’ve also been using the iPad in the kitchen a lot, especially for trying out recipes I find on blogs. My go to cooking app is How to Cook Everything , which you can get either for iPad or iPod/iPhone. There is also a free version available and vegetarian versions. What I like about these apps is that you can make notes, which I use to jot down carb counts if I figure them out for a recipe. 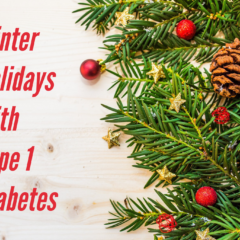 It’s once again the time of year to write about something other than diabetes. That’s right, it’s No D-Day. Last year I wrote about my newfound talent for burping. And ever since writing that post, I think of my DOC friends when I let out a Homer-worthy belch. 4yo was eating his bedtime snack. 4yo doesn’t quite understand that you aren’t supposed to yell “Over here!” during hide and seek. Also, quit giving up my position! 4yo: I catch bugs & flies with my tongue & eat them. Me: Are you a lizard? Him: No. I’m a boy. Q just announced that she wants to dance & sing under water when she’s a grown up (like Ester Williams). And said she’ll be famous for it. Why was the cookie sad? Q just put sunflower sprouts in R’s Cheerios because she thought he needed to eat more greens. Needless to say it made him cry! 4yo is telling jokes in the bathtub. I was teaching 4yo our address. I said (our street # and name), (our town), (our state), United States of America, North America, Earth. The LARGE titan arum, or corpse flower. 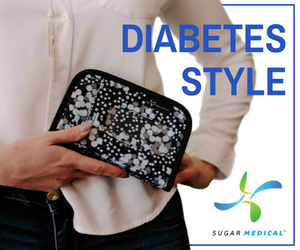 If you’ve come here for some diabetes wisdom today, you are out of luck. But if you want to hear about something cool, keep reading! 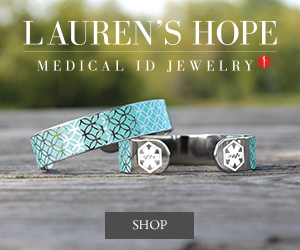 After all, there is more to life than diabetes. When I took a plant biology class a couple of years ago, the hands on lab was challenging, but very fun. As part of the class we were able to go to the department’s green house where we got up close and personal with some of the flora. What makes the rare corpse plant unique is that it takes ten years or more for it to bloom for the first time. It was discovered by scientists in 1878 in Indonesia. The first titan arum to bloom in the US was in 1937 at the New York Botanical Garden. The next one to bloom wasn’t until 1998! When flowering, the plant heats up to 100 degrees and emits a foul smell that attracts pollinators (and spectators and TV crews!) from long distances. The flower is only open for about 48 hours before it begins collapsing. We were able to see it at it’s peak! This photo doesn’t show the large scale of the plant, but for perspective, the top ruffle of the leafy skirt was even with my face. I had to lift Q up so that she could put her nose inside. We debated going back the next day to see it again, but the web cam showed that it was already closing back up. Q thought it smelled like rotten cheese. 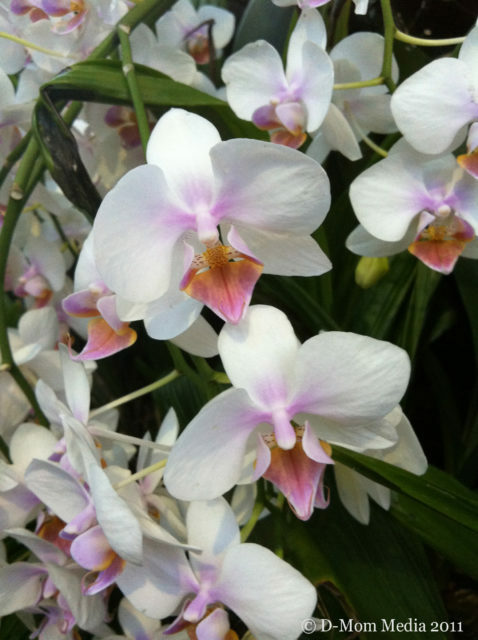 One of the many orchids in the greenhouse. 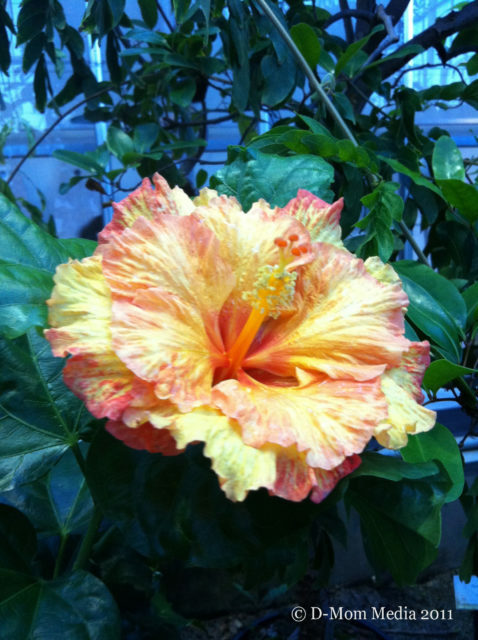 If my plant identification skills didn’t fail me, this is a hibiscus. All images copyright D-Mom Media 2011. I am functioning in a state of utter exhaustion, both mental and physical. I know you can empathize. I know you feel my pain. It’s rare that I sleep the night through. And even when I get a straight seven hours I quickly become exhausted again. I’m pulled in so many directions. My “to do” list is this long. My inbox is overflowing. My snail mail is stacked high. I have boxes from our move last June that are still unpacked. I can’t remember the last time I cleaned the bathrooms, let alone the rest of the house. I work almost full-time. I am the class parent at Q’s school. I lead lunchtime book club this spring. I am on my son’s preschool board of directors. I write this blog and another. 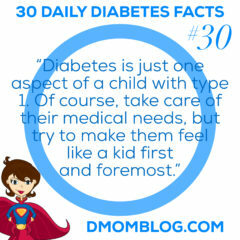 I am moderating a social network for parents of children with diabetes. 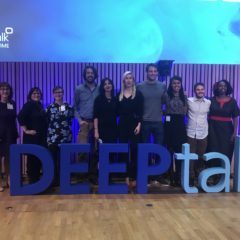 I am trying to get a business started (D-related, yay!). When I received an e-mail recently asking me to take a position with the elementary school’s PTA. Do you know what I said? Chez D-Mom, we have a yearly tradition that started I think when Q was 2. She and her Grandma make May Day baskets for neighbors, teachers, and my coworkers. I’m always surprised when people don’t know about May Day or why someone would leave leave a small treat on your doorstep, ring the doorbell, and run away. This year we went super easy and super quick and I think they turned out super cute. Super! 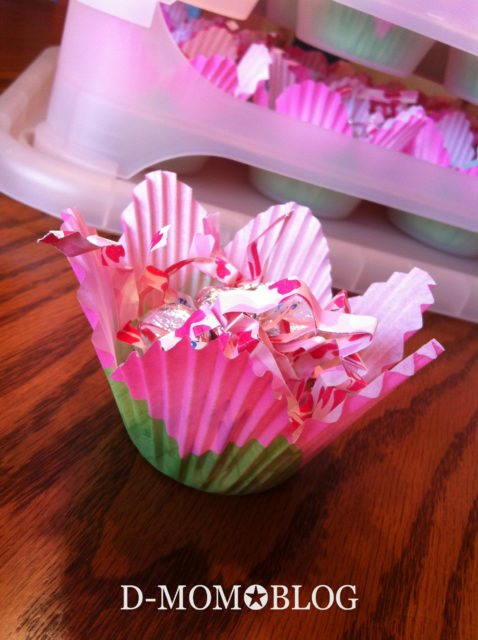 We found Wilton cupcake liners which look like tulips. 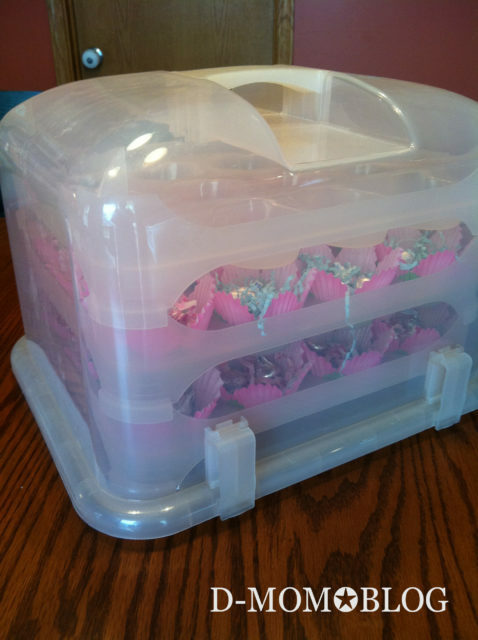 Q placed them in our Cupcake Courier (one of the best inventions ever!) 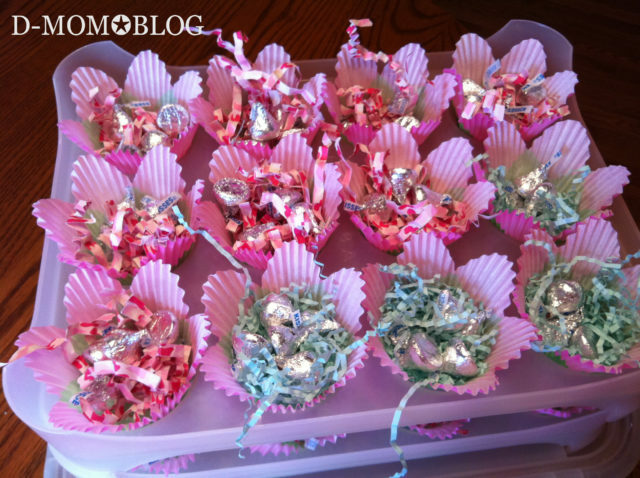 and then filled them with paper grass (borrowed from Grandma’s stash because our Easter Bunny does a scavenger hunt rather than filling baskets) and a handful of Hershey’s Kisses. Do you and your children celebrate May Day? Since we are actually going to hang our treats on the doorknobs of several neighbors, we are also making a few May Day baskets following Skip to My Lou’s May Day Basket tutorial. Very cute!